Deep Space Spines – Where we chronicle the non-canonical. This week, Picard brings Worf and Troi together to solve the mystery of a suspicious death, but it’s not quite the match made in heaven it will be a few years from now. As the investigation drags on, Wesley becomes the boy who knew too much, Beverly becomes the mother who knew too little, and Data gets a turn on the other side of the witness stand. Have the Kreel calmed down enough to gain Federation support? Has Worf overstepped a critical parental boundary? Have I finally become good at solving detective stories? All this and more in Contamination, a book that quite aptly could use a significant clean-up. This week, while Riker plays undercover spy, Data plays third base. With the Priority One message not going to him and having to put the Enterprise in park in case Riker gets deep in it, Picard isn’t quite sure what to do with all this free time. How did Riker get into jazz? How would this book be different if Data read the Baseball Prospectus? What did Michael Jan Friedman get right and wrong about the state of baseball in the 21st century? It’s the book that’s handed out for free by the Church of the Center Field Bleachers. 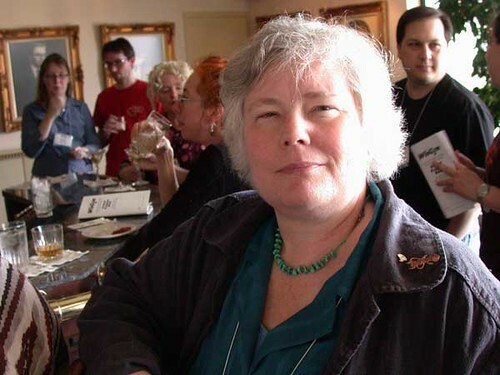 Vonda Neel McIntyre, Hugo- and Nebula-winning science fiction author, died of metastatic pancreatic cancer on April 1, 2019, just shy of only two months after a diagnosis thereof. She was 70.